Directly following on from my previous post, here is a picture of the front of the cabinet. 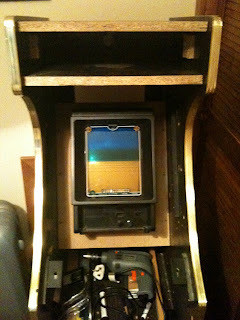 The Vectrex is supported by a wooden frame with a hole that accomdates the rear of the Vectrex. As the front of the Vectrex is bigger than the rear, it is unable to fall through the frame. I put the Vectrex at an angle otherwise if positioned completely upright, the height of the cabinet would have to be increased and the Vectrex raised even higher so that its screen suited to the player's eye level. Putting the vectrex at an angle means that people of different heights can all see the screen. My carpenter is currently completing a new wooden screen bezel. 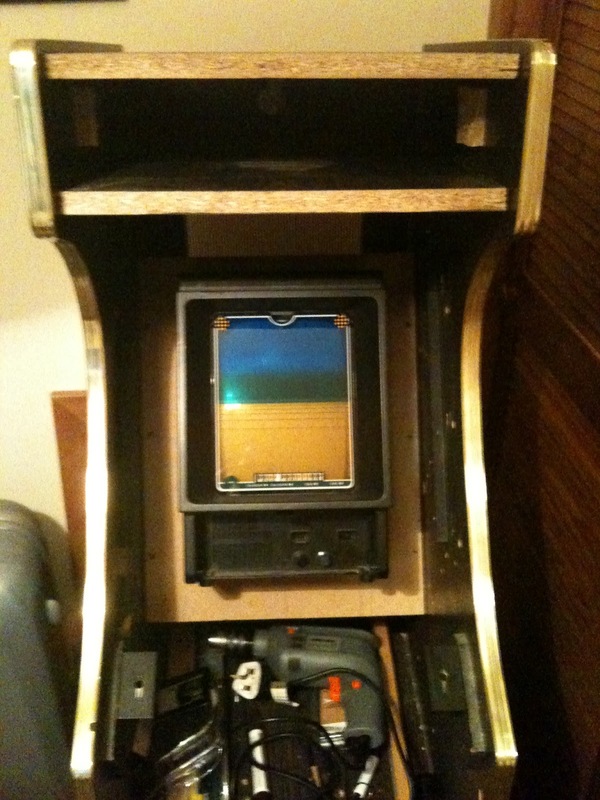 When the wooden bezel is in place, the Vectrex will be securely positioned. Ignore the rubbish underneath the Vectrex, that's just my temporay store for my tools and bits and pieces.